How to Create Fabric Appliqués with a Cutting Machine - Sew What, Alicia? I just love creating fabric appliqués and I have been searching for a great way to use my cutting machine with fabric. I have finally found a great way to make beautiful fabric appliqués with my cutting machine and I am so excited to share the process with you! Here is how to create fabric appliqués on a cutting machine. 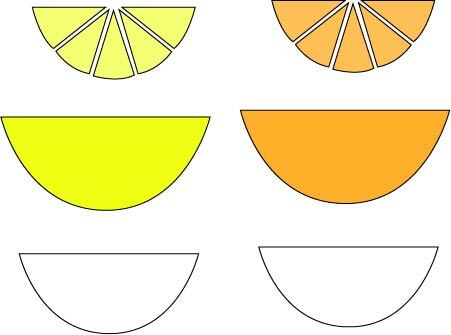 To make these citrus shoes you will want to start by downloading the file. See this post for tips on using files with your cutting machine. Cut your fabric into squares and then cut a piece of Heat n Bond just a touch smaller than the square and iron it on to the wrong side of the fabric. Arrange the images so that they are on three separate corners so that you can cut all the images at once. Then line your fabric with heat n bond side down on the same corners. Use the marks on the mat to line them up with the marks in the design software. Use your mini iron to attach the largest piece of the slice to the shoe by removing the backing on the Heat n Bond and pressing with the iron. Repeat this step with the white slice and the individual triangles. To make sure that the iron does it’s job I stuffed the toe of the shoes with paper. This gives you a firmer surface to iron on. That is it. You are all set! Didn’t these turn out so fun? Will you add a fabric appliqué to your shoes? Share with me in the comments below.